Ala-Archa is Natural National Park in Kyrgyzstan, from Kirgiz it means Ala – mottled and Archa – juniper. It was called like this thanks to abundant thickets of juniper, covering its slopes. 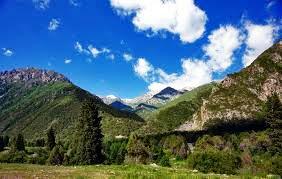 It is located 45 km from the capital of Kyrgyzstan, in the central part of the Kyrgyz Range of Tien Shan Mountains. The northern boundary of the district Ala-Archa is the mountains height of 1600 to 1800 m.
Summer in the Valley is cool and damp, average temperature is 12 °, maximum is 27-30 °. The warmest month is August. The spring months are mainly accompanied by precipitation and fog. Autumn in the area of the camp is warm and clear. The maximum temperature on September is 25 °, and the minimum -2,5 °. In October, the first snow falls here. Winter in Ala-Archa is cold enough. It happens that the temperature in February is raised to 0° and above. In the Ala-Archa gorge you can see 1,100 species of plants, and its fauna is rich and diverse. There are foxes, wolves, hares, badgers, porcupines, argali, snow leopard and griffins here. The National Park of Kyrgyzstan has been the object of active tourism since 1951 therefore there are many roads for tourists. Ak-Sai Waterfall is a local landmark, visited by tourists quite often. Having visited the national reserve Ala-Archa, you will be impressed by its magical mountains, stunning scenery and pure springs.